Nearly 1300 Silicon Valley business executives, government and community leaders and citizens packed the Santa Clara Convention Center last week for Joint Venture’s annual State of the Valley conference. The event featured an update on the region’s economy, three keynote speakers and other stimulating talks, a panel on funding future innovation in the valley, and the Packard Award. Joint Venture CEO Russell Hancock and Silicon Valley Community Foundation CEO Emmett Carson opened the conference by discussing the findings in the 2014 Silicon Valley Index, which shows that the regional economy is thriving and expected to get even better. The new prosperity, however, presents daunting challenges to accommodate the growth with sufficient housing, transportation and infrastructure, and is leaving middle and lower income sectors farther behind. California’s second in command and former San Francisco mayor Gavin Newsom capped the day with his view of how government can take advantage of Silicon Valley’s entrepreneurial climate and technological innovation to lift the state and the nation into a more connected, productive future. 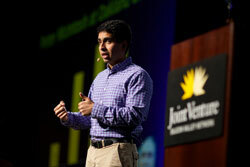 In his keynote remarks, Khan Academy founder Salman Khan told the audience the remarkable story behind his virtual teaching site, how it’s grown to ten million students in a few short years, and his vision for the future of the ubiquitous, online free classroom. University of Southern California professor Dr. Manuel Pastor, one of the nation’s foremost demographers, delivered a fact-filled and entertaining view of our changing state and how it is setting the pace for the way California and the nation will look 10, 20 and 30 years from now. “… California is America: Fast Forward,” he said. In a provocative look at the changing venture capital industry, venture capitalists Ray Rothrock and Sue Siegel and Accenture executive research fellow (Emeritus) Chris DiGiorgio discussed the future of funding innovation in Silicon Valley and beyond. Companies backed by venture capital have been a major source of technological innovation, economic growth and job creation over the last 40 years. But the venture capital industry is at a crossroads as it faces unprecedented competition and changing market dynamics. 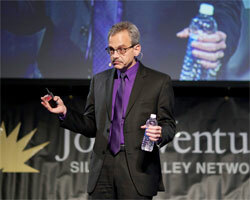 The day’s agenda featured three “TED”-style talks by highly contrasting speakers. Each spoke about how Silicon Valley’s fabled innovation can be harnessed to solve broader social and political problems. Investor and former Facebook Chief Privacy Officer Chris Kelly discussed bringing more technology into the delivery of government services; Forbes “30 Under 30” medical entrepreneur Divya Nag talked about reducing the approval time required for life-saving drugs; and 26-year federal prisoner turned penal reform activist Michael Santos tackled the problem of recidivism. 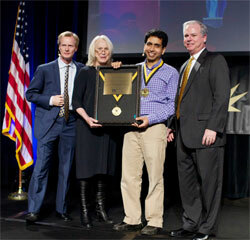 Before his keynote remarks, Sal Khan received the 2014 Packard Award, Joint Venture’s highest honor, for bringing a disruptive, cross-boundary approach to education. One of the Khan Academy’s early benefactors, Ann Doerr, made the presentation. 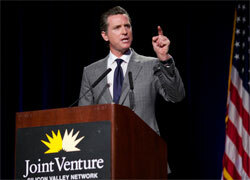 Read the Silicon Valley Business Journal coverage. Joint Venture is enormously grateful to our lead sponsor Silicon Valley Community Foundation, our presenting sponsors Accenture, Bank of America and Wells Fargo Bank for their invaluable support of State of the Valley and Joint Venture. We also salute and thank our more than 30 gold sponsors, 8 silver sponsors, 14 bronze sponsors, 45 copper sponsors, the Fairmont San Jose, Hello World and our media sponsors. 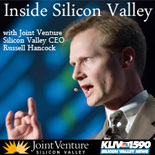 Presidents Day, California and Silicon Valley politics and the state’s finances are the remaining February topics on Joint Venture’s weekly public affairs radio program, “Inside Silicon Valley,” on 1590 KLIV. Scheduled guests include historian Clay Jenkinson in the persona of Thomas Jefferson (Feb. 14 & 16), political science professor and commentator Larry Gerston (Feb. 21 & 23), and state Controller John Chiang (Feb. 28 and March 2). Joint Venture CEO Russell Hancock hosts the hour-long program, which airs every Friday at 7 p.m. and again on Sunday at noon on 1590 KLIV. Listen to our podcasts on iTunes.